Description: In the seventh grade, L. Todd Rose was suspended -- not for the first time -- for throwing six stink bombs at the blackboard, where his art teacher stood with his back to the class. At 18 years old, he was a high school dropout, stocking shelves at a department story for $4.25 an hour. Sixteen years later, Rose was a faculty member at the Harvard Graduate School of Education. 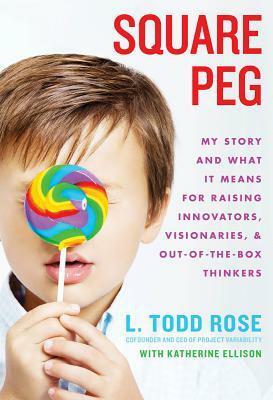 In SQUARE PEG, Rose takes us on an uncommon, personal journey that illuminates what it means to be a child who learns differently, or a parent or teacher a child who learns differently. He has concentrated scientific research into explanations and tips that will be meaningful for the many parents and educators with children and students who can sometimes be difficult to care for or teach. At the conclusion of each chapter, Rose has distilled the big ideas and action items from that chapter, making SQUARE PEG a functional guide, in addition to a compelling narrative. "It wouldn't have surprised anyone who knew me back then if I'd landed in jail by my twenties. It did surprise just about everyone that I wound up on the faculty of Harvard University." "My own early experiences, combined with what I've learned from this line of research, have convinced me that many a child's choice of "bad' behaviour over surrendering to powerlessness might well be a healthy survival tactic-and that if we as adults can understand it as such, we can judge less and help a lot more." "I still take Ritalin today, despite some mixed feelings about it. Like most people, I want to believe that I'm in control of situations, and don't like the idea of sharing that control with a pill." Educators - pick this up asap! L. Todd Rose is a faculty member at the Harvard Graduate School of Education, where he teaches a course on educational neuroscience. He is also cochair of the Connecting the Mind, Brain, and Education institute at Harvard. Friday, March 8th: Book Club Classics! Wow...this sounds like a really interesting read. Just added it to my "to-read" pile. Thanks for writing such a thorough review! Thanks Beth for stopping by and commenting. It makes my day when someone takes a few seconds to comment, I truly appreciate it! Sounds like many people would benefit from reading this book.